This Hang-a-Jar shows off your small and loose merchandise with ease. Simply attach it to your existing slatwall or pegboard display and fill it up with merchandise. 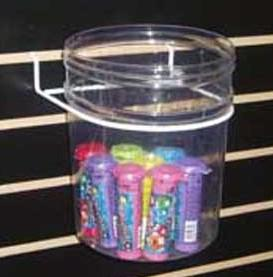 This hanging container lends the perfect way to organize and store candy, crafts, cosmetics, small hardware, and more! The clear containers let customers view all that you have and no guessing games. Customers will be hanging around to purchase items from these unique hanging jars. Don't hesitate. Start your order today at All Candy Containers and start filling those hanging jars for your customers to see. Dimensions: 6 3/4" diameter x 8 1/2" high.